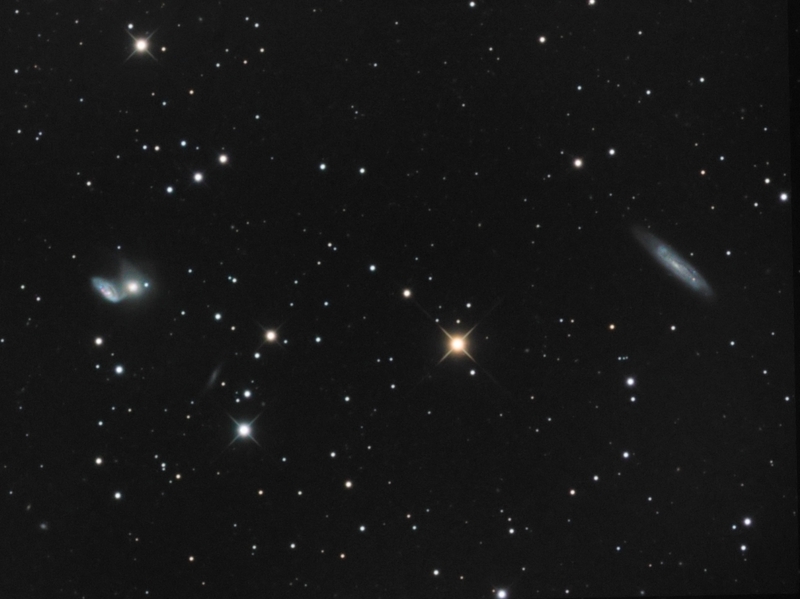 NGC 5953 (right most and NGC 5954 (to left of NGC 5953) are a set of interacting galaxies in the constellation Serpens. They are also known as Arp 91. A yellow 9th magnitude star lies in the center of the FOV with NGC 5951 at the right side of the frame. NGC 5953 appears to be quite distorted by the gravitational interaction. It has the nebulous appearance almost like an elliptical galaxy but it has been streteched out to a triangular shape. NGC 5954 did not escape the effects of gravity and it has one of its blue spiral arms visibly pulled outwards toward its partner. This is one of the objects described in the Galaxy Log video for July of 2014 - see http://www.youtube.com/user/GalaxyLog4565 for a visual observing report. Exposure: LRGB: L:5x10min R:5x8 min, G:5x6 min, B:5x10 min for a total of 2.8 hrs.